The actor George Alexander belongs to the busiest actors, his career continued smoothly till his death. He made his film debut in 1915 in "Der Schwiegervater seines Leutnants", it followed "Sonne und Schatten" (15) and "Die Liebe, sie war nur ein Traum" (16). In 1917 he got married with the actress Aud Egede Nissen, with whom he founded his own production company. Their first filmproject was "Die Geburt der Venus" (17). In the next few years Georg Alexander was worked both as an actor and as a director likewised. When he founded his company "Alexander-Film-GmbH" in 1919 he concentrated more again to the acting and played in the movies "Der Mann ohne Namen" (21), "Lady Hamilton" (21), "Eifersucht" (25), "Die Frau ohne Namen" (27), "Venus im Frack" (27) and "Schwarzwaldmädel" (29). 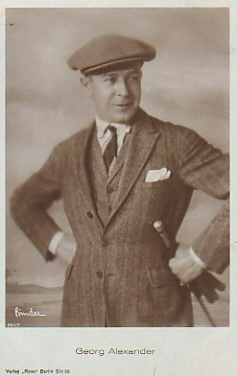 Georg Alexander was often engaged in the 30's too and he appeared in movies like "Der verjüngte Adolar" (31), "Madame wünscht keine Kinder" (32), "Die englische Heirat" (34), "Der alte und der junge König" (34), "Heimat" (38), "Der Kleinstadtpoet" (40) and "Frau Luna" (42). Besides his film activity he was also interested in sport, he was a racing driver horseman himself - he even set up a new record with a horse jump over the height of 1.85 meters. Georg Alexander was married with the actress Aud Egede-Nissen.